Today we welcome you to one of the best mileage trackers on the market these days, an automatic platform for all people who deduct mileage for their business trips. We’re very excited to share with you this incredible cross-platform app called MileCatcher. Developed and amazingly designed by MileCatcher, Inc., it is a smarter and more efficient way of tracking mileage, saving you time and money. 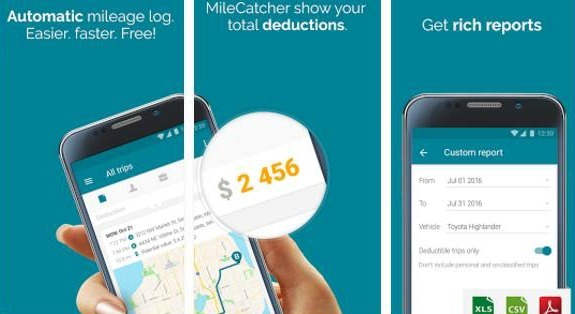 You can completely forget about all that hassle of filling your mileage book, MileCatcher is the ultimate time saver. It is perfect for people who drive using IRS tax rate and for people who get reimbursement using a custom business rate. Offering unlimited trip log, the app is smart, IRS compliant and has more built-in features than any other app of its kind. For instance, it provides with weekly and monthly detailed reports, it classifies up to 80% of your trips automatically, it can help you with file expenses while on the road, etc. Download the MileCatcher app from the App Store or from Google Play and get free unlimited trips plan or upgrade it to get premium plans. The app works on both smartphones and smart watches. For more information, click the links below.